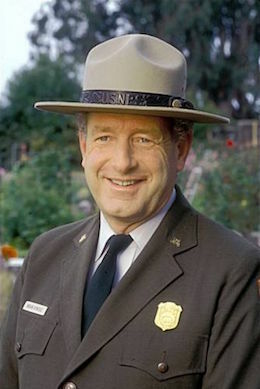 A pioneering force and mentoring figure in the National Park Service’s late 20th century history, Brian O’Neill was a perfect fit for Golden Gate National Recreation Area (GGNRA). Only a superintendent of his immense talent, charisma, and character could grow and manage such a sprawling, multi-layered national park embedded within a major metropolitan area and one of the most visited units in the national park system. In this NPS Centennial year when park rangers are doubling their efforts to reach new audiences, it is remarkable to note that O’Neill was working on that mission in the 1950s as a high schooler in the Washington, D.C. area. As University of Maryland freshman, he and his brother Alan formed a nonprofit organization that brought urban children on nature trips to national parks of the American West. With his abiding interest in outdoor experience, O’Neill became one of the first staffers of the nascent Bureau of Outdoor Recreation (BOR) in 1965. There he performed a various planning functions to include evaluating urban areas where federal land holdings might be consolidated to form new NPS units. The first two candidates were Gateway in New York City and GGNRA in San Francisco. O’Neill was part of a team that helped sway White House aides to push for the creation of these “urban” national parks. The Heritage Conservation and Recreation Service (HCRS) later absorbed BOR and then was folded into the NPS. Meanwhile, O’Neill continued to rise in the ranks—eventually settling in San Francisco, where he became GGNR assistant superintendent in 1981 and superintendent five years later. The park flourished under his visionary leadership. He oversaw the dramatic transformation of Crissy Field in San Francisco, the post-to-park conversion of Fort Baker in Marin, the acquisition of Phleger Estate and Rancho Corral de Tierra in San Mateo County, and the revitalization of Lands End and Alcatraz as world-class visitor destinations. O’Neill also shepherded the unique and delicate process of transitioning the Presidio from an Army base to national park site, developed groundbreaking community engagement programs, and inspired a thriving volunteer base that continues to set records for participation. A “friend-raiser” at heart, he established GGNRA as a trailblazing innovator in cross-sector partnerships, philanthropic initiatives, and community-based stewardship (alongside the Golden Gate National Parks Conservancy). His paper, “Brian O’Neill’s 21 Partnership Success Factors,” is considered a seminal work in park management circles, and he was instrumental in creating an assistant NPS director position at the national level focused on partnerships and civic engagement. However, O’Neill was most proud of his work with young people who will become the future stewards of America’s lands and waters—and of a nation’s natural and cultural heritage. For that reason, when O’Neill passed in 2009, the Parks Conservancy established the Brian O’Neill Youth Leaders Fund to cultivate and encourage the next generation of park and conservation leaders. Nearly 60 years after he and his brother sought to lead kids into the wild places of the West, O’Neill’s enduring legacy leads us all into the next century of our national parks.